Saving electricity and improving the energy efficiency is a lifelong battle that can be hard to conquer. Many gadgets on the market can meet your needs and reduce the burden on the electrical output. One such electronic device is a thermostat which regulates the heating and cooling in the home. 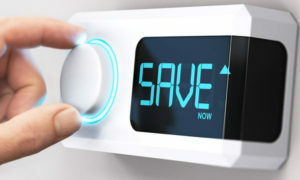 If you have the right type of thermostat installed in your home, you can save enormously on your electric bill. A programmable thermostat is a very sophisticated unit that allows you to input a schedule with settings that best suits your everyday needs. 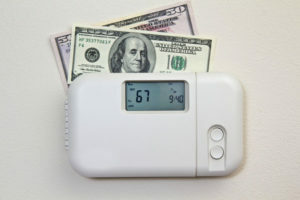 These thermostats can help you save on the heating and cooling costs by adjusting the temperature throughout the day. When the heating or cooling in your home runs continuously, there is a lot of wasted energy used. Does the house need to be so warm when you are at work? Or in the middle of the night while you are sleeping? A programmable thermostat allows the temperature to adjust automatically during the day based on who is home. When no one is home, set the temperature at an energy-saving level then have the temperature return to your comfort level before you return home. These basic thermostats are pretty easy to install and operate by metal bars heating up and cooling down. Although these may be as accurate, they are cheaper than programmable thermostats. These thermostats are not as smartly operated as the programmable thermostats but are still widely used due to the simplicity of their operative functions. For these to be energy efficient, the homeowner must manually adjust them. However, it is still unwise to use these thermostats as every time your temperature rises by 1 degree you end up consuming 10% more energy! Electric thermostats contain a sensor that controls the temperature and are programmable as well. You can control the thermostat from an app on your phone or check the temperature in your house at any time. These types of thermostats are often part of a whole-house control system which includes security, lights (indoor and outdoor), sprinklers, and thermostat. With the right choice of the thermostat and a careful inspection of all the essential factors such as keeping track of your saving potential and making the correct and smart use of the thermostat options, you can save an enormous amount of energy and money too! For more information on energy efficiency with your HVAC system, contact Good Deals Heating and Cooling at 215-947-1166.